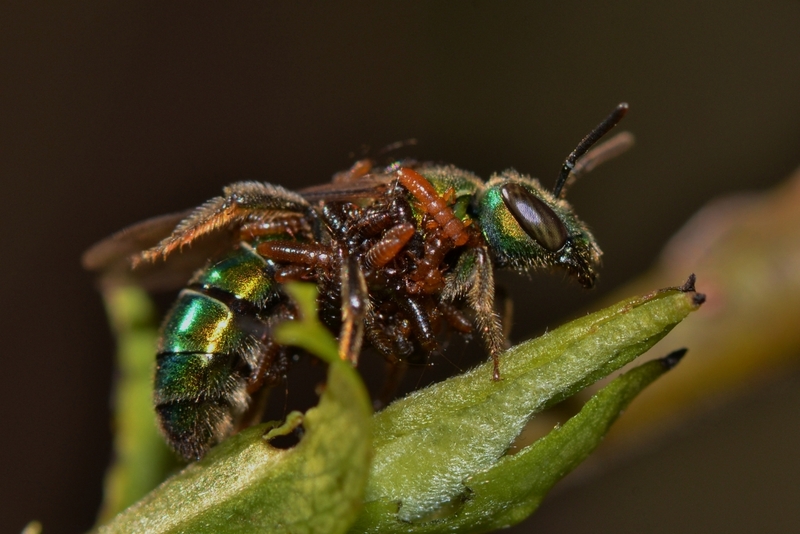 When I stopped to observe some roadside willows, I noticed this green metallic bee desperately trying to rid itself of its riders. 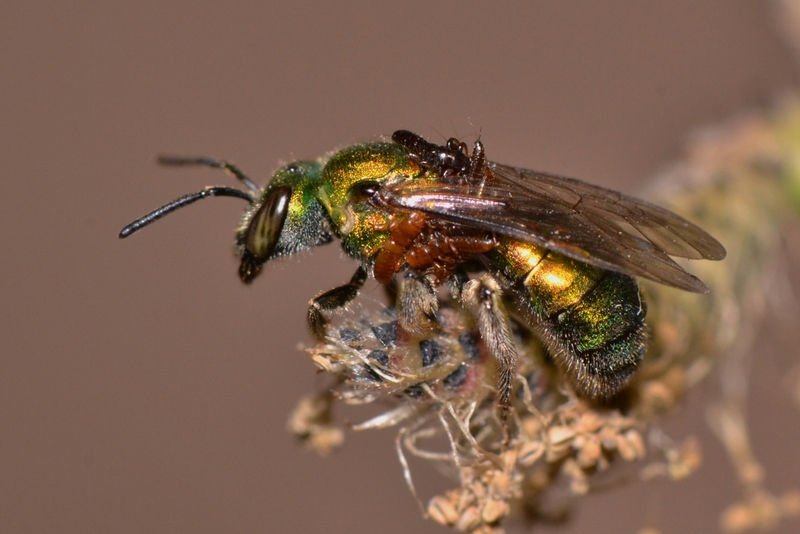 Please don't "gross out" when you see these photos of parasite-ridden bees. Those clinging larvae are not feeding on (or even hurting) the bee, but rather, they are simply hitching a ride... for now. The larvae must have just scrambled onboard the bee shortly before I spotted this interesting spectacle. The bees are providing passenger service for a bunch of tiny Oil Beetle larvae which are called triungulins, or planidial larvae. Unfortunately for the bees, the larvae's destinations are the bees' nests, where they will disembark and feed on the bees' food stores. Unfortunate bee, eh? 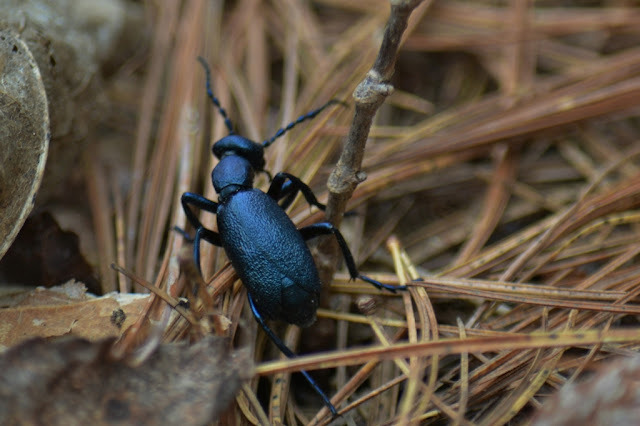 Here is a photo of an Oil Beetle. I don't know whether this adult beetle is the same species as the bee-riding larvae but I did see it nearby. I looked around in the willows and saw some more bees with hitchhikers. Here is a photo of another bee with larvae clinging to it. This bee has fewer passengers than the first one I saw. 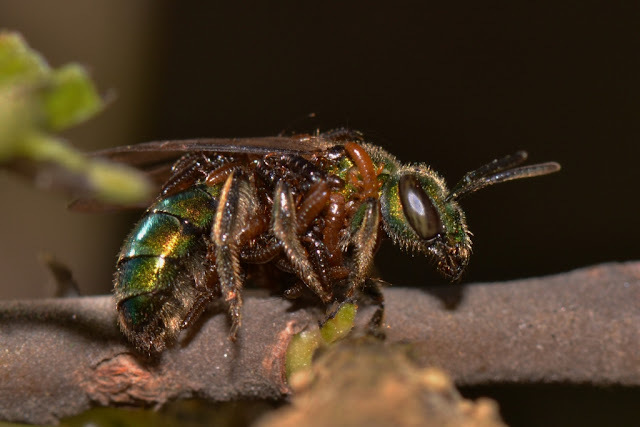 I found some bees with only one or two hitchhiking larvae... like this metallic green bee with only one triungulin hanging on tightly. The larva is partially under the wing and down the bee's side between the middle and back legs. With my back to the willow patch I could see some Coltsfoot flowers on the other side of the road. 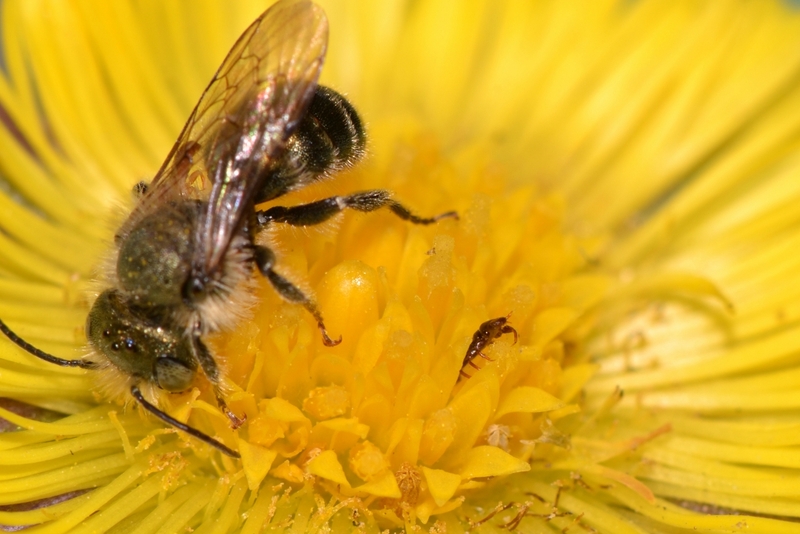 Would I find any of these bees and their riders on the Coltsfoot flowers? Yes... I caught three in a row and they all had at least one triungulin as a hitchhiker. How do the larvae get onboard the bees? Well, I looked high and low and didn't see much except this small aggregation of Oil Beetle larvae waiting in ambush on the tip of some young willow leaves. I'm guessing the bee I first encountered in the willows (the one that was literally covered with these clingy larvae) had picked up its riders when it got too close to a much larger cluster of waiting larvae. I understand some species of planidial larvae cluster on branch tips and actually emit bee-attracting pheronomes. When a male bee lands amongst them - he, fooled into thinking they are a female bee - the larvae hop onboard. The larvae then ride along with the male until he finds an actual female. Then they "jump ship" and hitch a ride with her back to her nest where they do their nasty work of feeding on the bee's provisions and offspring. 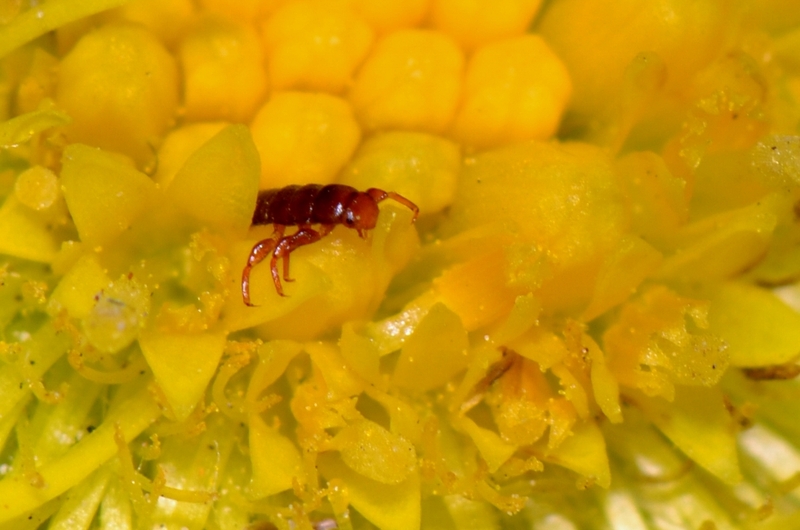 Other planidial larvae will wait in flowers in order to catch a ride on visiting bees. 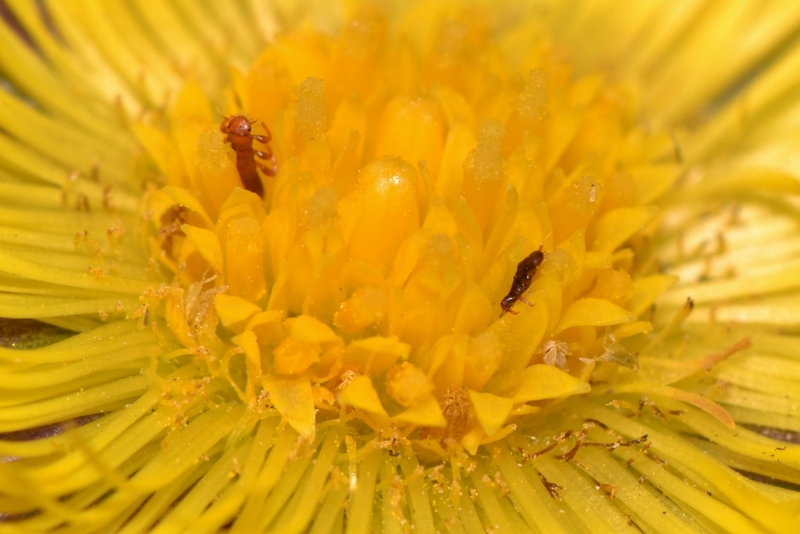 Here is a photo of some Oil Beetle larvae waiting in ambush in a Coltsfoot flower. Hey, look! 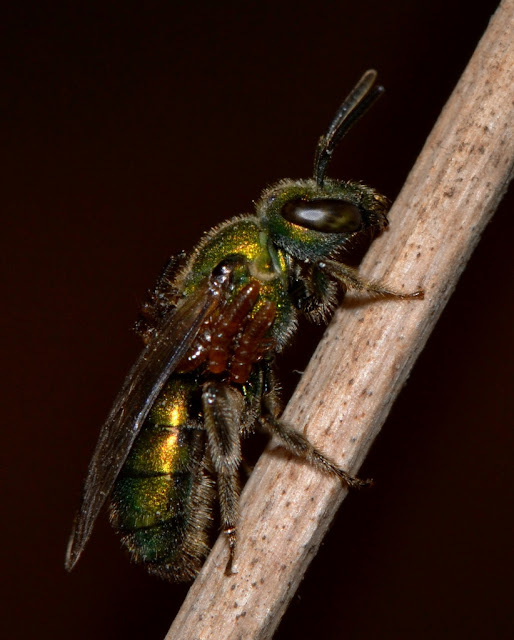 Here come a little green bee! Let's see what happens! 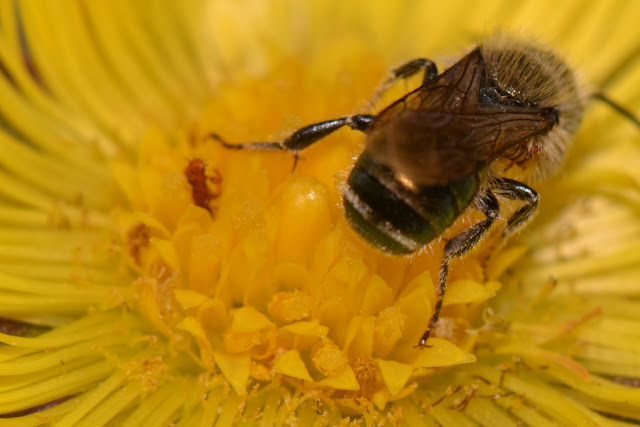 As the bee busily works at gathering nectar, you can see at least two larvae already riding on the bee (see the one through the wing on the left and the other larvae right above the middle leg on the right?). Notice the triungulin on the right in the photo above? In the photo below that same larva has disappeared because it has scrambled up onto the unsuspecting bee. I looked at many flowers and only saw two with larvae in waiting. As I mentioned, I also looked an the tips of many branches and stems and only saw one small aggregation of the larvae. Obviously the little green bees are picking up their passengers at scattered locations or I haven't learned to look at the right spots. I think these larvae and their life style to be interesting. However, they go through hypermetamorphosis. The first instars, the ones that hitch rides, are very active and go scrambling around. Once they reach the a bees nest they soon molt and turn into more of a grub-like larvae before turning into an adult Oil Beetle. I'm intrigued with the claws of the bee-riding larvae. In the photo below notice the position of the claws. The claw's angle make them great for gripping but not for walking on a flat surface...it's like they are walking on their knuckles. 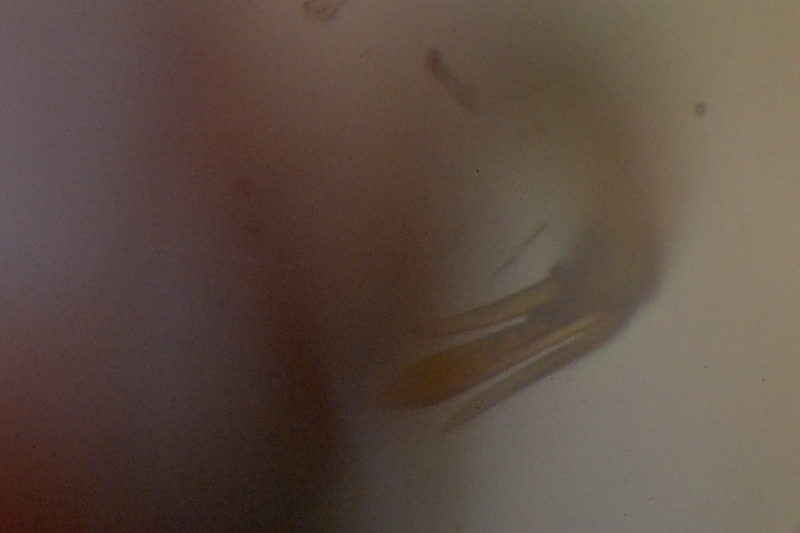 Here is a photo of a three-clawed "foot" taken through my microscope. The claw's surface that is in focus is the surface they walk on. 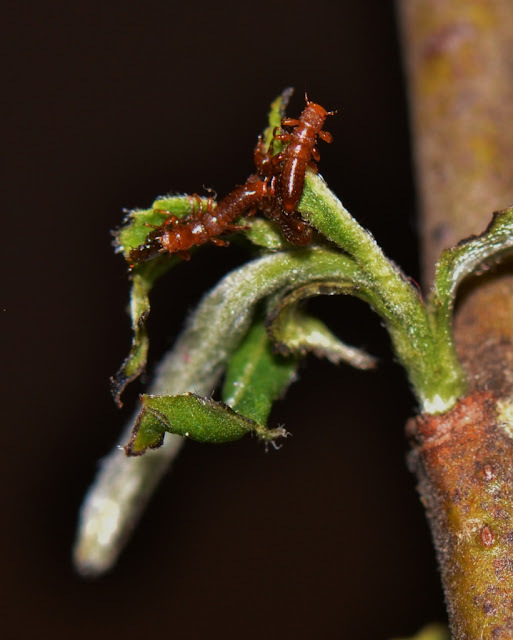 These specialized active larvae get the name triungulin from their three claws. Those claws work very well to enable the larvae to scramble up plant stems and later hang on to bees as they zoom from flower to flower. Now then, here is a parting shot of a parasite-ridden bee. 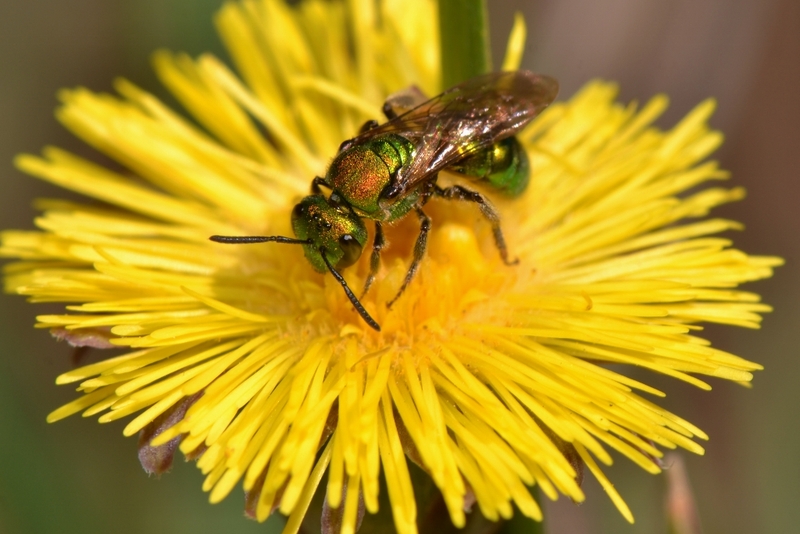 This busy little green bee will unknowingly be working for naught because it has been boarded by those sneaky freeloaders. Amazing yet sad, isn't it? Think about it! Nearby those roadside willows, in quite a few Halictid bee nests there will soon be a bunch of plump, grub-like Oil Beetle larvae living large on the pollen/nectar supplied by the diligent work of some unlucky little green bees. Judging by the amount of little green bees working the willows and Coltsfoot flowers, I'd have to say, "Not every flower nor every branch tip has little clingy larvae waiting in ambush... and plenty of these busy green bees never do pick up hitchhikers." Do you have a small patch of willows to visit? I'll bet there's much to be seen there amongst the willow shoots. Wow Dana. Amazing photos and explanation of this one-sided relationship. More for me to look for on my walks.